Outlook: Let’s just get this out of the way – this is likely the most preposterously deep group of freshman talent ever assembled (odds that it would be John Calipari coaching that group: -10000000). A collection of six (Six!) 5-star recruits and two 4-stars will step into a roster that lost nearly 90% of its minutes played and 93% of its scoring. Opportunities abound, but a major question that Calipari will need to find an answer for – who will be the alpha dog(s), and will everyone else accept supporting roles – may ultimately dictate how successful this historically young roster will be. Offensively, the ‘Cats have a conundrum with the combination of personnel they have. Quade Green is the only true point guard (though Shai Gilgeous-Alexander is a combo guard who can handle it some), and the team has a noticeable dearth of shooting with which to space the floor. Jemarl Baker is a knockdown gunner, but he’s also the lowest-rated recruit of the 8 freshmen, so whether he actually gets to see the court enough to make an impact remains to be seen. Similar to the 38-1 squad from 2014-15, this version will need to find different ways to score – likely through a furious assault on the rim, whether that be through transition offense, the offensive glass, repeated drives, or getting to the free throw line. The size and athleticism of this roster is baffling. The only returnees of note are post men Wenyen Gabriel and Sacha Killeya-Jones (sorry Tai Wynyard, I’m throwing shade), and Calipari adds four more 5-star forward/centers – Kevin Knox, Nick Richards, PJ Washington, and Jarred Vanderbilt. He will likely have to play Knox and Vanderbilt exclusively at the 3-spot, and luckily, both appear to have enough ball skills to make that work. Knox has a developing jumper and is a monster in transition, while Vanderbilt is a strong passer for that spot. The never-ending onslaught on the paint from this group of forwards will be enough to wear down many opponents through simple attrition, as UK’s depth may simply prove too much to handle over the course of a 40-minute game. But please don't mention the "P" word (pl_toon) - my Pavlovian response to it is to punch my TV and hide under the couch. A rare sight: a returning Kentucky player! The last and perhaps most dangerous weapon in Kentucky’s offensive arsenal will be its transition offense. As you’ll read below, they will be devastating on the defensive end, forcing a bevy of turnovers and long, bad jumpers – which means opportunities galore to get out on the break. Green was a little sloppy in these situations in the McDonald’s All-American game, but that was an exhibition (and he was clearly just going for wow-factor), and I'm sure he won't be nearly as careless with Johnny Cal roaming the sidelines. With Diallo, Knox, Vanderbilt, and Gilgeous-Alexander running the wings (plus mobile bigs), expect to see a lot of highlight real dunks in Lexington this season (get HYPED, Ashley Judd). The other aspect that will make Kentucky a nightmare to play against is the defensive potential. The aforementioned length and athleticism is endless – along with the frontcourt rotation, they’ll feature perhaps the best athlete in Division I, guard Hamidou Diallo. He wowed NBA scouts at the Combine with a 6’11.25” wingspan and a 44.5” max vertical, then decided to actually play a year in college and unleash holy hell on opposing guards. Diallo is the main weapon, but the combination of the Wildcats’ depth and glut of rebounding and rim protection means it’s a real possibility they could challenge the 2015 team’s defensive supremacy (best KenPom D in the last 5 years). I don’t think they’ll quite get there, but the fact that it’s even in consideration is terrifying. The Cats’ sheer size means they can harass opposing ball-handlers and perimeter shooters, running them off the three point line and funneling them into the forest of Redwoods (Bluewoods?) that await by the rim. Per Synergy, Calipari hasn’t played zone more than 2.5% in any of the past three years, and with the overwhelming athletic advantages his team will have in every game, he should stick to that. With Green’s quickness and Diallo’s overall defensive terror package, expect them to pick up full-court relatively frequently as well, something to which Coach Cal has shown a tendency. Bottom Line: Kentucky will be the youngest team in the country again this season, but it will probably also be the most athletic. The defensive upside is terrifying, but I don’t think the offensive ceiling is quite as high as past elite UK teams. I also am slightly bearish on the PG situation – there’s no hyper-efficient Tyler Ulis here to make things flow perfectly. 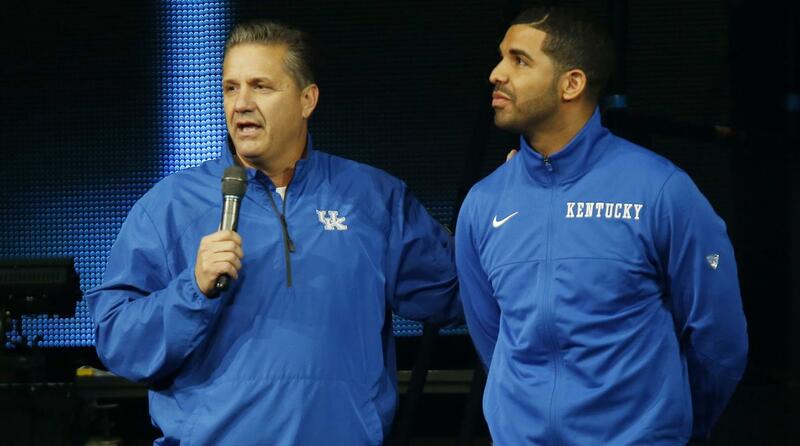 The defense+transition attack has them comfortably in the Top 10 and a Final Four contender once again, though it remains to be seen if that's quite good enough for Drake to be a Kentucky fan this year.